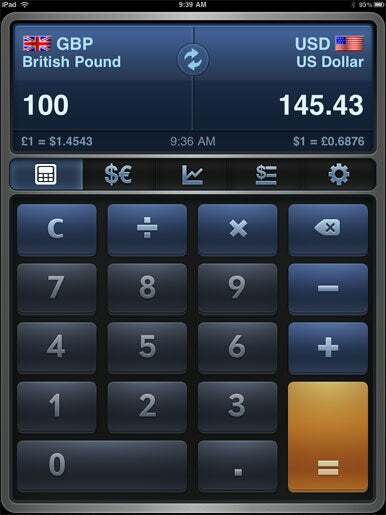 iCurrency Pad promises “not just a simple and elegant currency convertor and calculator”, and the $1 app from Sollico Software certainly delivers; it’s an excellent product for anybody needing to run quick conversions. 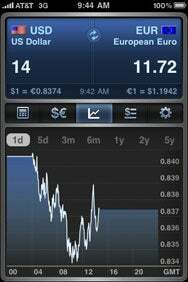 Dollars and Sense: Among the features included in iCurrency Pad is the ability to view a graph that tracks the difference between currency conversion rates over time. The core function of iCurrency Pad is to convert one currency to the next, and doing so is very simple. The user can choose between several “favorite currencies” or the entire selection of more than 150 different currencies. Unlike some of the other currency conversion tools available in the App Store, iCurrencyPad gives the user the ability to view the exchange rates of the world’s currencies in comparison to your base currency. There’s even a feature in which you can view a graph to track the difference between the conversion rate between your two selected currencies over time. Bigger and Better: While it runs on all of Apple’s mobile devices, iCurrency Pad in its iPad form feels like a scaled-up version of the iPhone app. iCurrency Pad is optimized for both the iPhone and iPad. In many respects, the iPad version is just a scaled-up version of the iPhone edition. There are no new features, but having the larger screen to view graphs and selection options is nice. Currency conversion is a simple task; the best tool for the job is one that allows you to take care of the process quickly and efficiently. iCurrency Pad does just that. It’s simple, powerful, works well, and, given its low price tag, won’t force you to part with too much of your own currency.